The history of printing goes back to the duplication of images by means of stamps in very early times. The use of round seals for rolling an impression into clay tablets goes back to early Mesopotamian civilization before 3000 BCE, where they are the most common works of art to survive, and feature complex and beautiful images. In both China and Egypt, the use of small stamps for seals preceded the use of larger blocks. In China, India and Europe, the printing of cloth certainly preceded the printing of paper or papyrus. The process is essentially the same - in Europe special presentation impressions of prints were often printed on silk until the seventeenth century. The development of printing has made it possible for books, newspapers, magazines, and other reading materials to be produced in great numbers, and it plays an important role in promoting literacy among the masses. Block printing is a technique for printing text, images or patterns used widely throughout East Asia both as a method of printing on textiles and later, under the influence of Buddhism, on paper. As a method of printing on cloth, the earliest surviving examples from China date to about 220. Ukiyo-e is the best known type of Japanese woodblock art print. 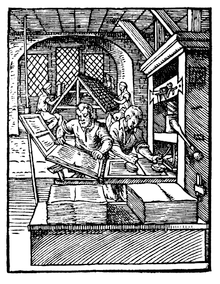 Most European uses of the technique on paper are covered by the term woodcut (see below), except for the block-books produced mainly in the fifteenth century. The world's earliest printer printed fragments to survive are from China and are of silk printed with flowers in three colours from the Han Dynasty (before AD 220). The technology of printing on cloth in China was adapted to paper under the influence of Buddhism which mandated the circulation of standard translations over a wide area, as well as the production of multiple copies of key texts for religious reasons. It reached Europe, via the Islamic world, and by around 1400 was being used on paper for old master prints and playing cards. 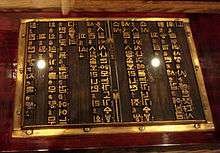 The third oldest wood-block printed book ever found after Mugujeonggwang great Dharani sutraand Hyakumantō Darani is the Diamond Sutra. It carries a date of the 13th day of the fourth moon of the ninth year of the Xiantong era (i.e. 11 May 868). A number of printed dhāraṇīs, however, predate the Diamond Sūtra by about two hundred years (see Tang Dynasty). In Buddhism, great merit is thought to accrue from copying and preserving texts. The fourth-century master listed the copying of scripture as the first of ten essential religious practices. The importance of perpetuating texts is set out with special force in the longer Sukhāvatīvyūha Sūtra which not only urges the devout to hear, learn, remember and study the text but to obtain a good copy and to preserve it. This ‘cult of the book’ led to techniques for reproducing texts in great numbers, especially the short prayers or charms known as dhāraṇīs. Stamps were carved for printing these prayers on clay tablets from at least the seventh century, the date of the oldest surviving examples. Especially popular was the Pratītyasamutpāda Gāthā, a short verse text summing up Nāgārjuna's philosophy of causal genesis or dependent origination. Nagarjuna lived in the early centuries of the current era and the Buddhist Creed, as the Gāthā is frequently called, was printed on clay tablets in huge numbers from the sixth century. This tradition was transmitted to China and Tibet with Buddhism. Printing text from woodblocks does not, however, seem to have been developed in India. 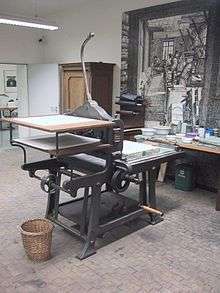 Printing with a press was practiced in Christian Europe as a method for printing on cloth, where it was common by 1300. Images printed on cloth for religious purposes could be quite large and elaborate, and when paper became relatively easily available, around 1400, the medium transferred very quickly to small woodcut religious images and playing cards printed on paper. These prints were produced in very large numbers from about 1425 onwards. Stencils may have been used to color cloth for a very long time; the technique probably reached its peak of sophistication in Katazome and other techniques used on silks for clothes during the Edo period in Japan. In Europe, from about 1450 they were very commonly used to colour old master prints printed in black and white, usually woodcuts. This was especially the case with playing-cards, which continued to be coloured by stencil long after most other subjects for prints were left in black and white. Stenciling back in the 27th century BCE was different. They used color from plants and flowers such as indigo (which extracts blue). Stencils were used for mass publications, as the type didn't have to be hand-written. 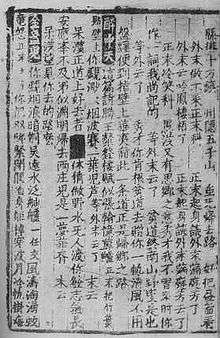 Korean moveable metal typeset form, used to print 月印千江之曲 in 1447. Around 1040, the world's first known movable type system was created in China by Bi Sheng out of porcelain. He also developed wooden movable type, but it was abandoned in favour of clay movable types due to the presence of wood grains and the unevenness of the wooden type after being soaked in ink. Neither movable type system was widely used, one reason being the enormous Chinese character set. Metal movable type began to be used in Korea during the Goryeo Dynasty (around 1230). 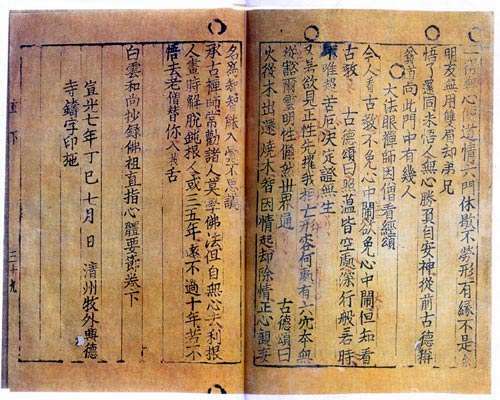 Jikji was printed during the Goryeo Dynasty in 1377, it is the world's oldest extant book printed with movable metal type. This form of metal movable type was described by the French scholar Henri-Jean Martin as "extremely similar to Gutenberg's". 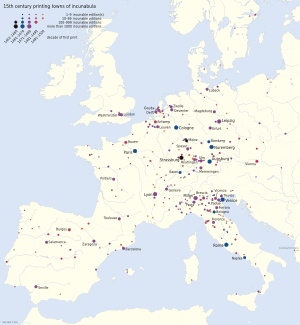 East metal movable type may have spread to Europe between late 14th century and early 15th century. It is traditionally summarized that Johannes Gutenberg, of the German city of Mainz, developed European movable type printing technology with the printing press around 1439 and in just over a decade, the European age of printing began. However, the details show a more complex evolutionary process spread over multiple locations. Also, Johann Fust and Peter Schöffer experimented with Gutenberg in Mainz. Gutenberg is also credited with the introduction of an oil-based ink which was more durable than previously used water-based inks. Having worked as a professional goldsmith, Gutenberg made skillful use of the knowledge of metals he had learned as a craftsman. Gutenberg was also the first to make his type from an alloy of lead, tin, and antimony, known as type metal, printer's lead, or printer's metal, which was critical for producing durable type that produced high-quality printed books, and proved to be more suitable for printing than the clay, wooden or bronze types used in East Asia. To create these lead types, Gutenberg used what some considered his most ingenious invention, a special matrix where with the moulding of new movable types with an unprecedented precision at short notice became feasible. Within a year of printing the Gutenberg Bible, Gutenberg also published the first coloured prints. 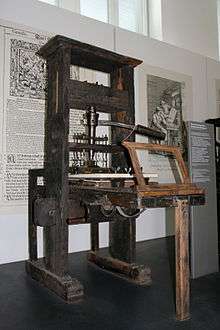 The invention of the printing press revolutionized communication and book production leading to the spread of knowledge. Rapidly, printing spread from Germany by emigrating German printers, but also by foreign apprentices returning home. A printing press was built in Venice in 1469, and by 1500 the city had 417 printers. In 1470 Johann Heynlin set up a printing press in Paris. In 1473 Kasper Straube published the Almanach cracoviense ad annum 1474 in Kraków. Dirk Martens set up a printing press in Aalst (Flanders) in 1473. He printed a book about the two lovers of Enea Piccolomini who became Pope Pius II. In 1476 a printing press was set up in England by William Caxton. The Italian Juan Pablos set up an imported press in Mexico City in 1539. The first printing press in Southeast Asia was set up in the Philippines by the Spanish in 1593. The Rev. Jose Glover intended to bring the first printing press to England's American colonies in 1638, but died on the voyage, so his widow, Elizabeth Harris Glover, established the printing house, which was run by Stephen Day and became The Cambridge Press. The Gutenberg press was much more efficient than manual copying and still was largely unchanged in the eras of John Baskerville and Giambattista Bodoni, over 300 years later. By 1800, Lord Stanhope had constructed a press completely from cast iron, reducing the force required by 90% while doubling the size of the printed area. While Stanhope's "mechanical theory" had improved the efficiency of the press, it still was only capable of 250 sheets per hour. German printer Friedrich Koenig would be the first to design a non-manpowered machine—using steam. Having moved to London in 1804, Koenig met Thomas Bensley and secured financial support for his project in 1807. With a patent in 1810, Koenig designed a steam press "much like a hand press connected to a steam engine." The first production trial of this model occurred in April 1811. Johannes Gutenberg's work in the printing press began in approximately 1436 when he partnered with Andreas Dritzehen—a man he had previously instructed in gem-cutting—and Andreas Heilmann, owner of a paper mill. It was not until a 1439 lawsuit against Gutenberg that official record exists; witnesses testimony discussed type, an inventory of metals (including lead) and his type mold. Court records from the city of Mainz document that Johannes Fust was, for some time, Gutenberg's financial backer. 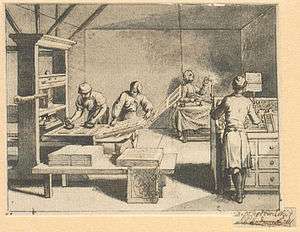 By the sixteenth century jobs associated with printing were becoming increasingly specialized. Structures supporting publishers were more and more complex, leading to this division of labour. In Europe between 1500 and 1700 the role of the Master Printer was dying out and giving way to the bookseller—publisher. Printing during this period had a stronger commercial imperative than previously. Risks associated with the industry however were substantial, although dependent on the nature of the publication. Bookseller publishers negotiated at trade fairs and at print shops. Jobbing work appeared in which printers did menial tasks in the beginning of their careers to support themselves. Subscription publishing—pioneered by the English in the early 17th century. A prospectus for a publication was drawn up by a publisher to raise funding. The prospectus was given to potential buyers who signed up for a copy. If there were not enough subscriptions the publication did not go ahead. Lists of subscribers were included in the books as endorsements. If enough people subscribed a reprint might occur. Some authors used subscription publication to bypass the publisher entirely. Installment publishing—books were issued in parts until a complete book had been issued. This was not necessarily done with a fixed time period. It was an effective method of spreading cost over a period of time. It also allowed earlier returns on investment to help cover production costs of subsequent installments. The Mechanick Exercises, by Joseph Moxon, in London, 1683, was said to be the first publication done in installments. Publishing trade organizations allowed publishers to organize business concerns collectively. Systems of self-regulation occurred in these arrangements. For example, if one publisher did something to irritate other publishers he would be controlled by peer pressure. Such systems are known as cartels, and are in most countries now considered to be in restraint of trade. These arrangements helped deal with labour unrest among journeymen, who faced difficult working conditions. Brotherhoods predated unions, without the formal regulations now associated with unions. In most cases, publishers bought the copyright in a work from the author, and made some arrangement about the possible profits. This required a substantial amount of capital in addition to the capital for the physical equipment and staff. Alternatively, an author who had sufficient money would sometimes keep the copyright himself, and simply pay the printer for the production of the book. A rotary printing press is a printing press in which the impressions are carved around a cylinder so that the printing can be done on long continuous rolls of paper, cardboard, plastic, or a large number of other substrates. Rotary drum printing was invented by Richard March Hoe in 1843 and patented in 1847, and then significantly improved by William Bullock in 1863. Intaglio /ɪnˈtæli.oʊ/ is a family of printmaking techniques in which the image is incised into a surface, known as the matrix or plate. 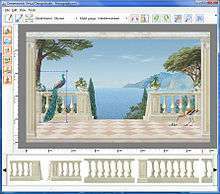 Normally, copper or zinc plates are used as a surface, and the incisions are created by etching, engraving, drypoint, aquatint or mezzotint. Collographs may also be printed as intaglio plates. To print an intaglio plate the surface is covered in thick ink and then rubbed with tarlatan cloth to remove most of the excess. The final smooth wipe is usually done by hand, sometimes with the aid of newspaper or old public phone book pages, leaving ink only in the incisions. A damp piece of paper is placed on top and the plate and paper are run through a printing press that, through pressure, transfers the ink from the recesses of the plate to the paper. Xerographic office photocopying was introduced by Xerox in the 1960s, and over the following 20 years it gradually replaced copies made by Verifax, Photostat, carbon paper, mimeograph machines, and other duplicating machines. The prevalence of its use is one of the factors that prevented the development of the paperless office heralded early in the digital revolution. ↑ "History of Printing Timeline". American Printing History Association: To Encourage the Study of Printing History. Retrieved 22 December 2015. ↑ A Hyatt Mayor. Prints and People. Princeton: Metropolitan Museum of Art. ISBN 0-691-00326-2. ↑ Arthur M. Hind (1963) . An Introduction to a History of Woodcut. Houghton Mifflin. pp. 64–127. ISBN 0-486-20952-0. ↑ http://www.bl.uk/onlinegallery/hightours/diamsutra/index.html The Xiantong era (咸通 Xián tōng) ran from 860-74, crossing the reigns of Yi Zong (懿宗 Yì zōng) and Xi Zong (僖宗 Xī zōng), see List of Tang Emperors. The book was thus prepared in the time of Yi Zong. ↑ Zwalf, Buddhism: Art and Faith (London: British Museum, 1985). 1 2 3 4 5 6 7 Polenz, Peter von. (1991). Deutsche Sprachgeschichte vom Spätmittelalter bis zur Gegenwart: I. Einführung, Grundbegriffe, Deutsch in der frühbürgerlichen Zeit. (in German). New York/Berlin: Gruyter, Walter de GmbH. ↑ Thomas Christensen (2007). "Did East Asian Printing Traditions Influence the European Renaissance?". Arts of Asia Magazine (to appear). Retrieved 2006-10-18. ↑ Juan González de Mendoza (1585). Historia de las cosas más notables, ritos y costumbres del gran reyno de la China (in Spanish). ↑ L. S. Stavrianos (1998) . A Global History: From Prehistory to the 21st Century (7th ed.). Upper Saddle River, New Jersey: Prentice Hall. ISBN 978-0-13-923897-0. ↑ In 1997, Time Life magazine picked Gutenberg's invention to be the most important of the second millennium. In 1999, the A&E Network voted Johannes Gutenberg "Man of the Millennium". See also 1,000 Years, 1,000 People: Ranking The Men and Women Who Shaped The Millennium which was composed by four prominent US journalists in 1998. ↑ Typography - Gutenberg and printing in Germany. Encyclopædia Britannica ©2007. ↑ "Planographic Printing". The New York Public Library. 1999-10-23. Retrieved 2014-11-21. ↑ Clapper, Michael. "'I Was Once a Barefoot Boy! ': Cultural Tensions in a Popular Chromo." American Art 16(2002): 16-39. 1 2 3 Ferry, Kathryn. "Printing the Alhambra: Owen Jones and Chromolithography." 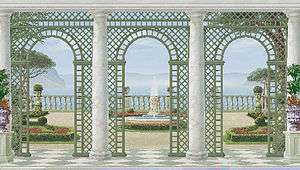 Architectural History 46(2003): 175–188. ↑ Roy A. Allan (2001). A History of the Personal Computer: The People and the Technology. Allan Publishing. ISBN 0-9689108-0-7. 1 2 Campbell, Alastair. The Designer's Lexicon. ©2000 Chronicle, San Francisco. 1 2 3 Twyman, Michael. Eyre & Spottiswoode, London 1970.